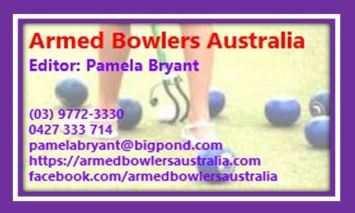 Armed Bowlers Australia | All things relating to Lawn Bowlers using a mechanical bowling arm. Thanks Pamela, you are doing more than your share for armed bowlers. In particular, I like the way you are prepared to post radical views. I believe that “toeing the party line” is what inhibits progress and all bowlers know that we need some real progress. Fashion (colored clothing) is put forward as progress but let’s be fair, if fashion (what we wear as recreational bowlers) is our biggest progress in 50 years, then as bowlers we do need to “air our options”. Pamela, my congratz and thanks to you.